Worldwide, the chemicals industry always has had a consistency issue between countries with chemical classification. There have been many different standards to help ease complying with the complex differences between hazard classification regulations in different countries. In response, the Globally Harmonized System of Classification and Labeling of Chemicals (GHS) was adopted by the United Nations as an international system of standards for labeling and classifying hazardous chemical substances. Already used in Europe, Canada and the United States, GHS is quickly becoming the worldwide standard for chemical labeling and safety. Translations Services USA can translate your MSDS to any language and ensure the new version complies with these standards. The GHS classification systm ensures that chemicals are always classified the same way, regardless of their country of origin or distribution. 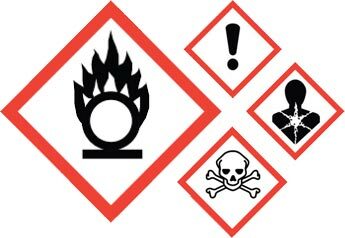 Translations Services USA can advise you on methods for the writing MSDS and chemical labels, and can create a GHS-compliant MSDS specific to the country requirements by combining basic some building blocks: signal words, hazard codes, pictograms, and precautionary statements. When you need to a fully-compliant translation of a Material Safety Data Sheets (MSDS), Translations Services USA is the leading translation agency to help you accomplish this in accordance with any country-specific regulations. Our clients have included Sunoco, Siemens and Gerber. If your company sells or manufactures chemical products internationally, Translations Services USA can help you not only translate your chemical labeling and MSDS, but ensure they conform to the international GHS requirements. To request a quote or learn more about Translations Services USA's SDS translation and GHS conversion services, please contact us using our get quote request form.